Disney is gradually becoming a mega-monopoly in Hollywood, buying up nearly every property in town from Pixar to Marvel to LucasFilm (and, eventually, 20th Century Fox) and releasing some of the biggest blockbusters of the past decade that have earned them billions upon billions of dollars worldwide. However, some feel that the House of Mouse’s growing power over the film industry as we know it is becoming a threat to genuine originality, with many of their releases either being franchise fare or big-budget remakes of their own animated works, and that has caused a divide between audiences that are going out to see these films, and the critics who continuously point out how their support just encourages laziness when it comes to creativity. I’m all for the belief that anyone has the right to enjoy anything, and that nobody should be told how or what to think about any film, regardless of its quality; with that being said, I think that Disney’s latest animated venture, Ralph Breaks The Internet – the sequel to the studio’s hit 2012 film Wreck-It Ralph – is going to either confirm those fears about the studio for some people, or they’re just going to forget about all that and have a good enough time with it. For me, I don’t think it’s as strong a movie as the first one, but there are things about it that work well enough for me to put it above some of the other animated sequels out there. It’s been six years since the events of the last film, and video game characters Wreck-It Ralph (John C. Reilly) and Vanellope (Sarah Silverman) have maintained their strong friendship whilst living in a local arcade. However, when the steering wheel for Vanellope’s game is broken, her game is unplugged, leaving her and the game’s inhabitants homeless. Desperate to help his friend get her home back, Ralph comes up with a plan to sneak into the recently-plugged Wi-Fi router and enter the World Wide Web in search of a replacement wheel. Soon, they are both whisked away to the wonders of the Internet, characterised as a mega-city where brands like Instagram, Twitter and eBay are giant buildings filled with billions of human avatars doing their everyday browsing, where they both discover how to become trending topics, a Disney fan-site that is filled with cameos from all sorts of Disney alumni – including the much-publicised appearance of every Disney princess in one scene – and a grittier, much more violent racing game that seriously attracts Vanellope’s attention, a fact that Ralph doesn’t take too kindly to. The way this movie plays out is like a way, WAY better version of The Emoji Movie (but then again, that was always a guarantee), as it does a lot of similar things that were also done in that movie, but here it’s done with way more ambition and passion than anyone who ever worked on that film ever had, even though there are still hints of corporate mandating in this one (but again, handled a hell of a lot better). However, because it is a movie about the Internet in this day and age, with all of the apps and trending topics it throws at you at nearly every turn, I anticipate that this movie is not going to age as well as, say Frozen or Tangled will; it’s like watching a movie now that was made ten or fifteen years ago and has references to Pimp My Ride or (more appropriately) High School Musical, and cringing at how dated some of these pop culture references have become as opposed to back then. Who knows what the next ten or fifteen years are going to bring us, but unless apps like Snapchat and Pinterest or popular videos like the screaming goat and Chewbacca Mom somehow find a way to remain relevant in the future, then I am inclined to assume that people looking back on this film won’t have even heard of those things. Even though this film won’t age quite as well as some of Disney’s more recent animated classics, the film is not a total failure. It has a strong message at its core about the nature of friendship and not letting your insecurities control how you treat other people, and the central relationship between Ralph and Vanellope is certainly very sweet and heart-warming (though you do wonder why everyone is simply okay with this adult male always hanging out with a very young girl). The film disappointingly doesn’t have as many laughs as the first film does, but the jokes that do land are often worth the wait; the funniest stuff is with the Disney princesses and the tropes that come with all of them, including the notion that you can spontaneously burst into song by just staring into water (it kind of makes you want to see an Avengers-style team-up movie with all of them, which is something that I’m genuinely surprised Disney hasn’t put into development yet). It is also, of course, exceptionally animated with a climax that features one of the most fascinatingly realised visual ideas for a final villain that the studio has put out in many years, which is both technically impressive and a rather creepy idea all at the same time. While there is no denying that Disney seems to be taking over the world right now, Ralph Breaks The Internet is a slight but mostly satisfying reminder that they still have the power to make decent movies as they continue to dominate. 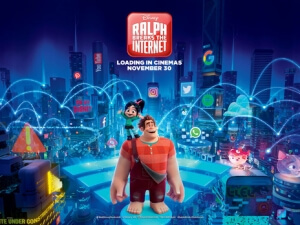 Ralph Breaks The Internet is a decent though not as strong follow-up to Disney’s Wreck-It Ralph that likely won’t age well, but has enough heart and humour to carry itself through a flawed but reasonably fun animated adventure.